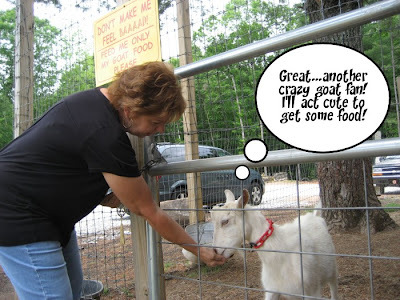 CONFESSIONS OF A PLATE ADDICT: Outdoor Wednesday...or...Let's Go to Goats on the Roof! 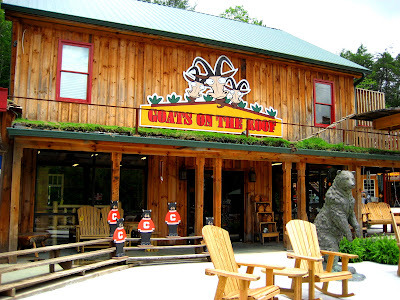 Outdoor Wednesday...or...Let's Go to Goats on the Roof! 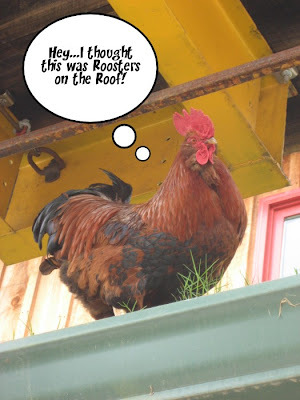 ...on the roof! lol If you have known me very long, you know I LOVE goats! I want one of my own, but my HOA doesn't allow them. :-( Soooo...I'll just visit these! ...and pedal this little bicycle contraption to send it up to the roof. Thanks to my friend Nan for providing the pedal power! Oh, look! 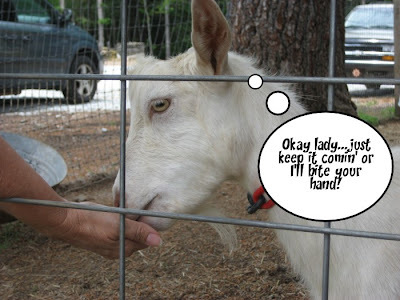 The sweet little goats can hardly wait to get their food! Aren't they cute! There's even a ramp that lets them come down to be fed. Look at this little sweetie pie! Isn't this adorable? The little cutie is eating right out of my hand! Awwww! There's my favorite goat...the little black and white one! I look for that one each time I come here! If only I could take the little critter home with me! Is that not the cutest thing you have ever seen? Sigh! Look! There's even a rooster! What's he doing here? Of course, this is a country store, so you have to buy some homemade fudge. Mmmm...peanut butter...my favorite kind! And you have to have a souvenir tee shirt! And I guess if I can't have the real thing, I'll take these! Aren't they cute? Well, let's load up our souvenirs and head out! Sigh! I love this place! Thanks for coming with me! I hope you enjoyed our little visit to Goats on the Roof! Please be sure to stop by Susan's to see what everyone else is up to! I'll see you next time! A la prochaine! Oh I am just laughing at this. I love, love, love that anxious and impatient look on their faces waiting for the feed to arrive. Too, too funny!! Oh my! I know goats like to climb but I've never seen anything like that before. Goats on the store, peanut butter fudge(nobody has ever made it as good as my Great Grandma!) and a rooster to boot. What a great time. Debbie, I have never heard of this place. Goats on the Roof - how fun! I've got to visit this place someday. I'm with you, I think goats are cute. they're great little lawn mowers too! What a great place! I really enjoyed reading all about it... thanks for sharing! Now that's a unique spot!! I like it. Now pass me some fudge and no one gets hurt!! I love your post ! Goats on a Roof - who would have thunk ? Looks like those goats know what to expect - Power to the Peddle ! Oh My! I've never seen Goats on a roof (at least not on top of a building) - I guess I have seen some on some sheds. My granddaughter would love to see that! How cute they are! I want to go there! It looks like so much fun. Thanks for sharing! Oh my goodness, what a neat place! Great pics, they are too cute! How amazing! Looks like you were in your element! What a wonderful place to have close by..they are cute but I can remember first hand you don't want to turn your back on them!! HI Debbie! What a hoot! Who would have ever thought of this? A crazy person, I suppose! I love those goats too and it's especially wonderful that you got to feed them! I hope you feed the rooster too! My Dear - that was hilarious. I love it! goats on a roof, to funny, thanks for making me smile. Now that's one way to attract customers! LOL Great concept and great goats! Cute as heck post! I loved it. Fun, fun, fun!. I am finding myself typing along with that music..faster and faster and faster...hands are blurred..now..now...now..now..
yeah! LOVE that banjo music! But...little fingers....ah..ok..all over...whee..oops here comes more..gotta go..
That place looks like a lot of fun! Very clever and I'm sure lots of traffic because of the goats! They are so cute and you took great pictures. What a cool place!! I knew a couple that owned a grass farm...and they had several goats that always stayed on top of their barn...it was hilarious!! Seriously? You PEDDLE to give the goats food? ROFLOL. What wonderful pictures of a wonderful day. You're a very creative lady. Thanks for sharing them with us. Have a wonderful day. Two things. My mom had a family goat when she was a girl. The goat hated her and she hated the goat. It was not a pretty picture. 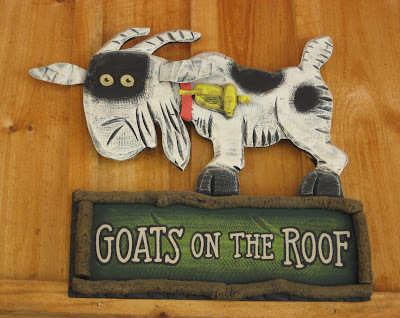 Also, in Door County, Wis. there is a goat on the roof eatery. 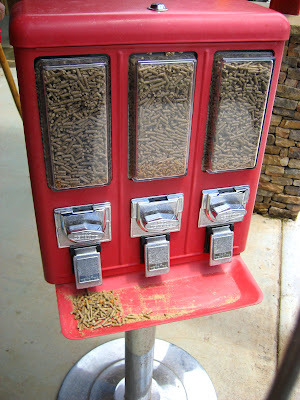 I always loved going there when I was a girl. Not my mom though. Happy Outdoor Wednesday. I'm new to the blogger world and just discovered your blog last night. I've spent hours since reading through your past posts. What fun! Do you know about the Quimper Club International? If not, check out the site and the blog: www.quimperclub.org. This year's annual meeting will be held in Dallas, TX, October 21-25. Interesting speakers, tours of private collections, antique shopping, museum visits, and a member faience sale. QCI is celebrating its 10th year this year. You should join the club and try to make the meeting. The yearly meetings are awesome events! Hope you will join us! Thanks for taking us to visit Goats on The Roof. I loved it. I too want a goat, but no time to care for them. Gotta love the South! 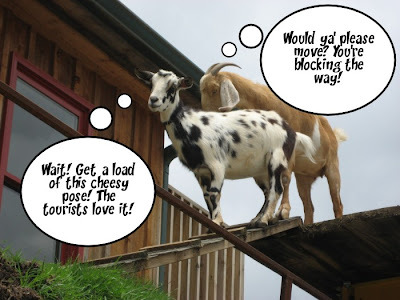 Where else would you find a place with goats on the roof, lol ;o) I just loved your post! I have wanted pygmy goats for a long time...but alas...I have to visit them too. Cuteness!!! This looks like a fun place. Oh how cute is this!?!?! I love goats too. Isn't it funny that they love being up so high? I had them growing up - they were never in their "house", always on top of it - even in the rain. LOL! Thanks for sharing - I bet this was one fun day! What a fun post! I would totally love to go there. Aren't HOA's a pain? I'm so glad we don't live in one (even though our neighbors act like we do). My hubby once had a piggie (before me) & his HOA made him get rid of her. He still talks about his little piggie & it's been 20 some years. I see goats each morning on the way to work. There is always a herd of goats or sheep eating the grass along the freeway. Better than a lawn mower. I loved the virtual tour of the goats on the roof. Your blog is so fun! OMGosh! I've never seen anything like this before! And there are actually goats on the roof! I think my favorite picture is of the two waiting for that feed cup to get to them. What hilarious expressions on their little faces! If I ever get to your part of the country this place will definitely be on my list of things to see!